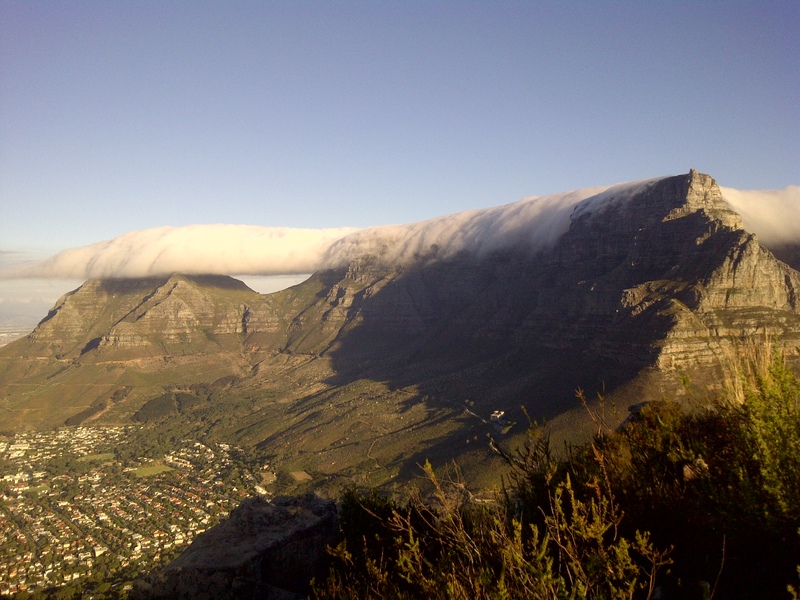 As Capetonians we are so incredibly blessed to have such a magnificent mountain such as Table Mountain, literally in our back yards!! Known as one of the seven natural wonders of the world, this magnificent mountain stands proud of the city as it dominates our skyline. 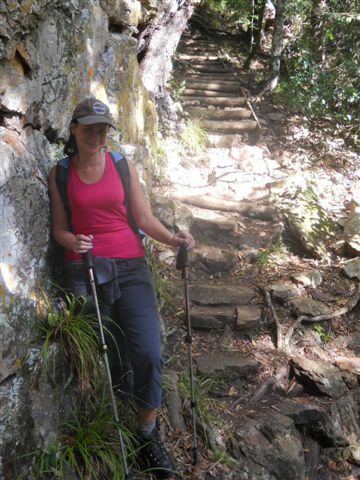 Yesterday, Donna and I headed out to hike up Skeleton Gorge with our route back down via Nursery Ravine. 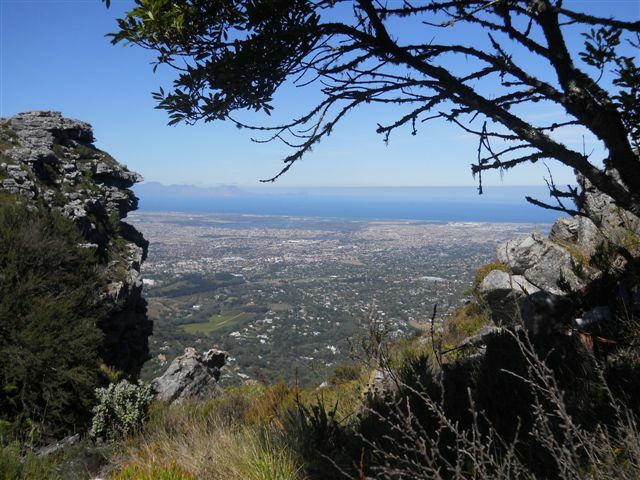 It was another gorgeous day here in Cape Town and we were eager to get back on the mountain. Skeleton Gorge ~ Our route up the mountain. Right, not difficult at all, noted!! Donna, my hiking partner, ready to go! 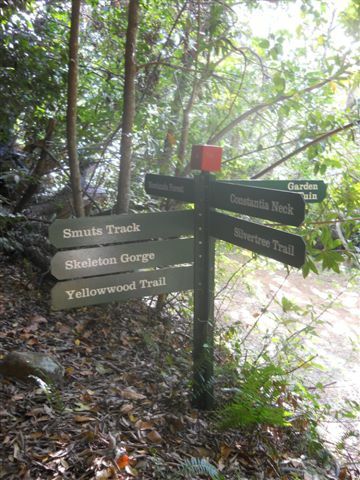 The route up Skeleton Gorge ascends steeply from the beautiful Kirstenbosch Gardens, following a magical forest gorge up the back of Table Mountain. 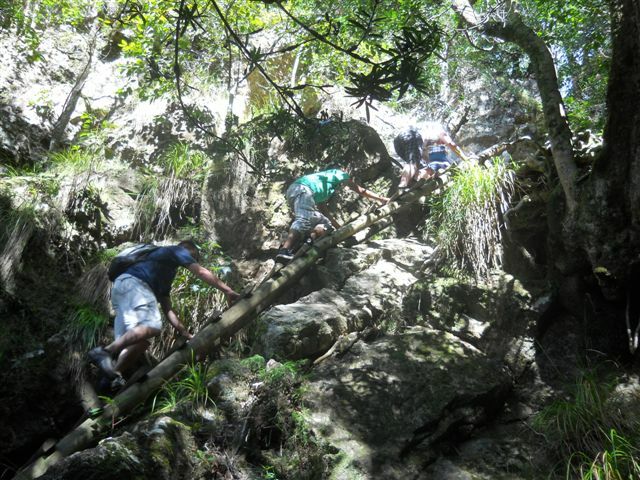 The route has some adventurous climbing on a number of wooden ladders to help us hikers get over some steep, exposed and rocky areas. For those who need the proof ~ Yup, I was definitely there! Just one of the ladders helping hikers over the steep rock patches. 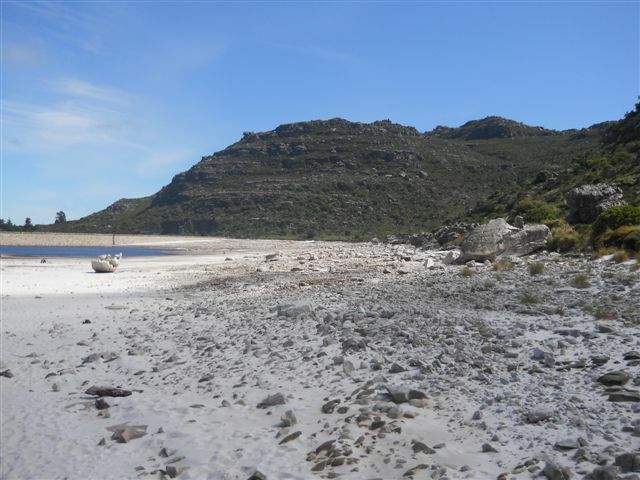 We were surprised to find the route rather busy, and at times I found myself wishing for the silence of the magical forest we were waking in but then again maybe we had just being spoilt with the solitude of hikes such as Fish River Canyon and Otter Trail. It’s funny how we get used to things and then sometimes crave it when we can’t have it. But much to my delight, in the end, our hike turned into a rather social one. 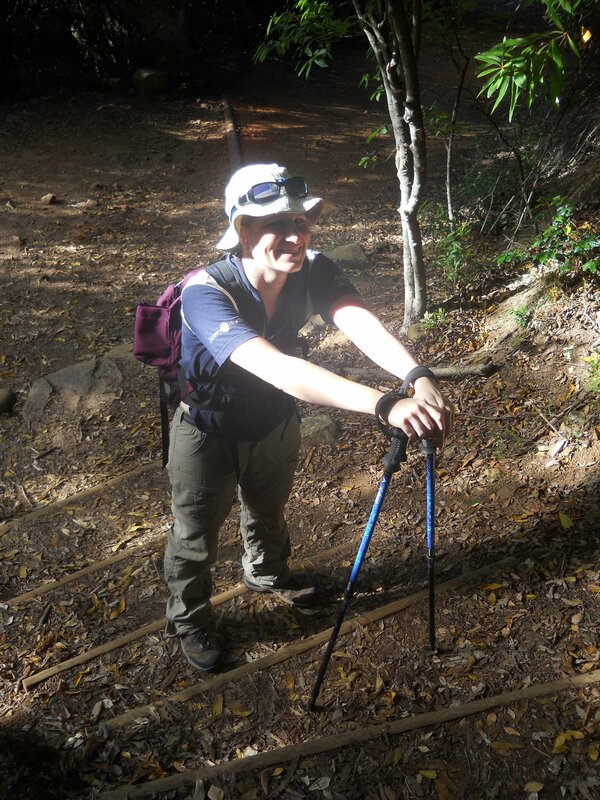 A number of times as passing other hikers many a conversation formed, laughs were shared and there was so much camaraderie as we made our way up the steep ravine! 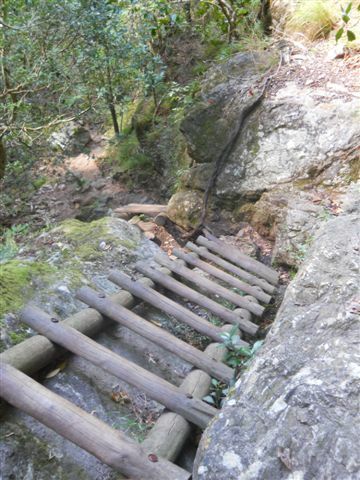 Hikers making their way up the wooden ladders. Despite the number of people feeling energetic enough to venture out on this mid-week holiday, we were hiking through an indigenous forest with foliage of Yellow and Ironwood trees overhead and we had the feel of pure organic earth underfoot. I was in my happy place! 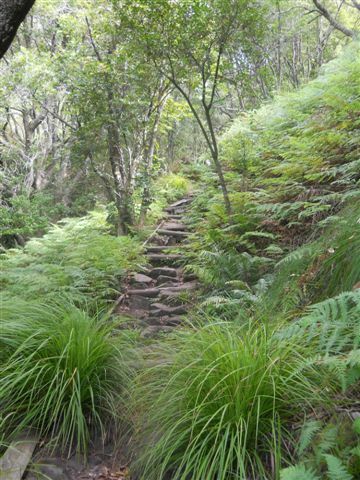 From stairs, to rocks to ferns. Such incredible beauty all on one hike! Before we knew it the sun started peeking through the tree tops and we could see the blue sky above. 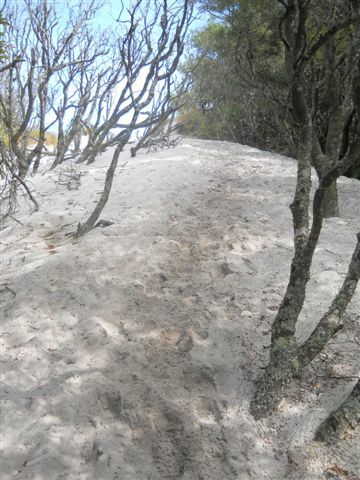 The soil and rocks beneath our feet turned to glorious white sand and for a moment I forget I was on a mountain! We knew we were nearing the top and the “beach” on top of our beautiful mountain was close. Around another rock, one last climb up and suddenly we emerged into a glade of sunlight and the mountain top “beach” lay before us. The tree’s parted and the blue sky appeared. We were near the top! The rocks and soil made way for, um, beach sand! Yip you could be forgiven for wondering if we were still on the mountain! 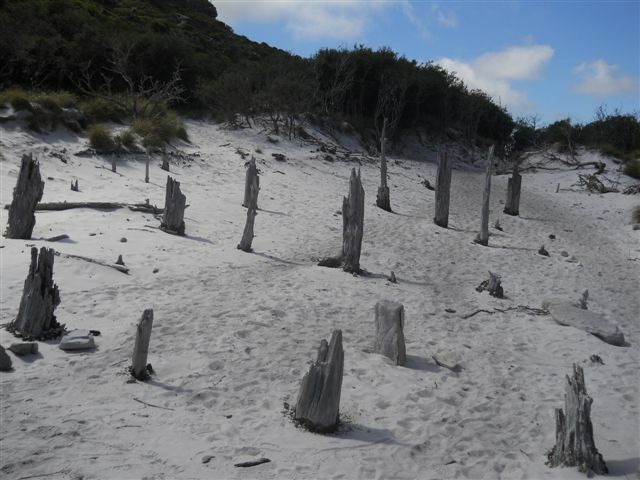 The tree trunk graveyard on top of Skeleton Gorge. Maybe that’s where the name comes from…. 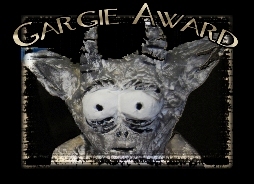 I must admit it was almost eerie! There was practically no one around, except for one group that were just starting to make their way down again and then we were left there on the “beach” with dead tree trunks sticking up out of the sand. It looked like a tree graveyard and it really was eerie. I was almost grateful it was sunny and there was no mist from the usual cloud cover on the mountain as that would have just been down right creepy up there!! A view of the “beach” in front of the Hely-Hutchinson Dam. Unusual rocks on the “beach” at the top. Part view of the Hely-Hutchinson Dam on top of Table Mountain. 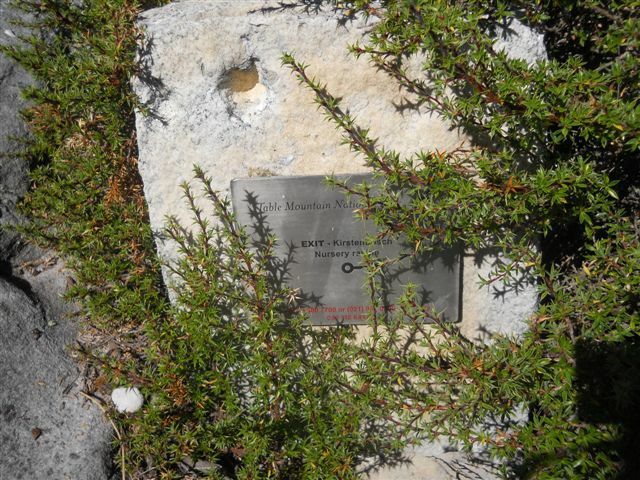 As we made our way forward past the graveyard of trees, we were rewarded with the sight of our very own mountain top dam, called the Hely-Hutchinson Dam. This was a perfect lunch spot! 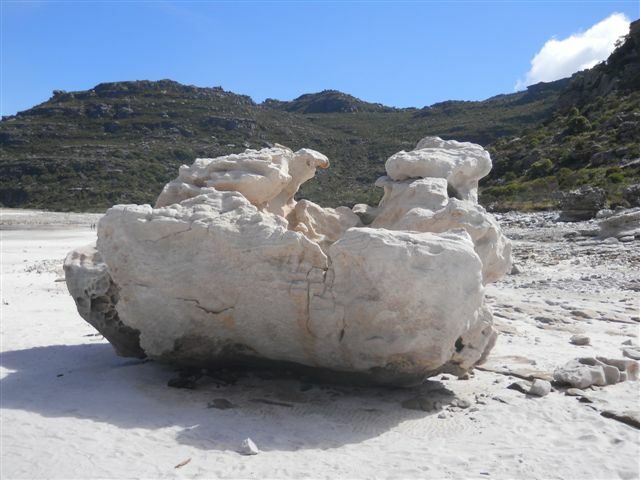 We found some nice flat rocks on the white sand and lunch was served! During lunch we chatted excitedly about our Africa trip. Ideas of what we want to do, options of where we can go and of course talk of Kilimanjaro! When lunch was snuggly in our tummies we both lay back, lazing like lizards in the sun on our rocks and before we knew it, we were both dozing away in the warm sunshine! This surely was the best way to spend a mid-week day off. 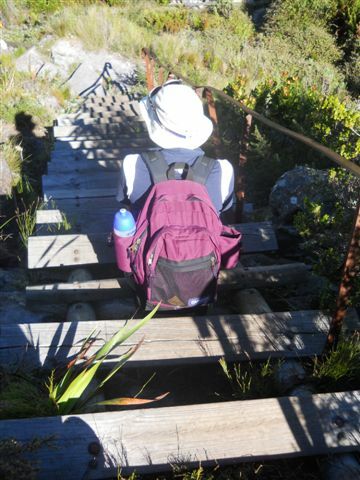 After our super-long-lazy lunch it was time to head back down the mountain via Nursery Ravine. Heading back down the mountain was no different from going up, we stopped and had some interesting chats with some French visitors who were having lunch and red wine on the dam wall and shortly after leaving, while walking along the dam wall we bumped into a doctor and his dog, whom we then walked a quarter way down Nursery Ravine with until we went our separate ways. Nursery Ravine was simply breath-taking and involved hundreds and hundreds of steep steps with sheer cliff walls on the side, which also offered welcome shade from the afternoon sun. On our way down we bumped into a young man running up this ravine. He stopped to let us pass by and naturally a conversation ensued mostly to check his mental wellness… I mean seriously, running UP this route. Insane I tell you!!!! Donna, sitting on some seriously steep stairs (the picture really doesn’t do it justice) admiring the view that lay before us. Absolutely love this picture of her sitting quietly, taking it all in! The steep stairs leading down Nursery Ravine. Just one of the gorgeous views that greeted us as we headed down Nursery Ravine. 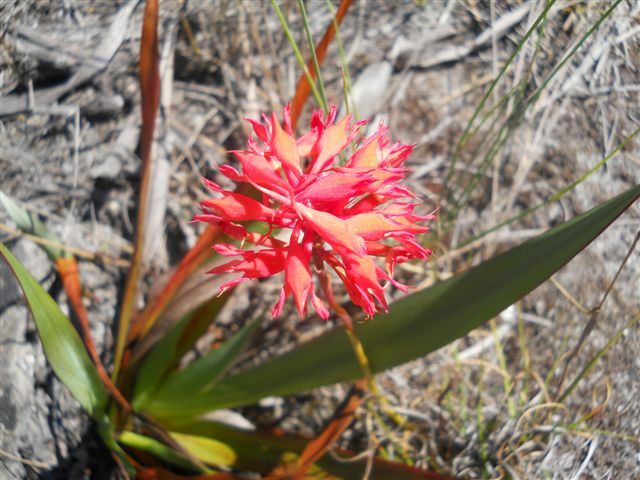 Beautiful flowers among the fynbos. 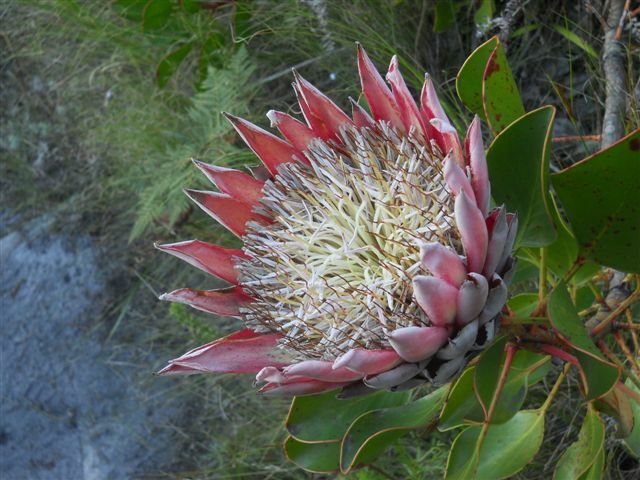 A Protea, South Africa’s National Flower. Reaching the bottom late in the afternoon, two satisfied hikers, this surely was a great hike full of beauty, exercise and perfect for our training! 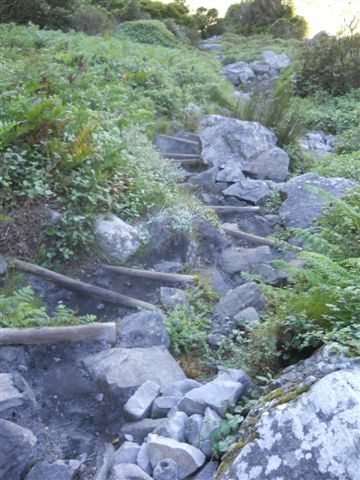 We will be back and next time we’ll be going UP those stairs of Nursery Ravine, except we certainly won’t be running! Oh, and just in case you were wondering, it was like heaven in a pair of hiking boots! No pain, ultra-light and super comfortable. I am happy to report, me and my feet are still on talking terms!! I will never forget the day you did Skeleton Gorge in your plakkies! :) You made the whole hike without any incident and then on the gravel road on the way back to the car, you slipped! I still laugh when I think about it! !